Country Power ~ The Electrical Revolution in Rural Alberta recounts the history of the people and events that made possible the implementation of rural power in our province. The original book was released in 1993 in Edmonton AB. It shares the story of the Alberta REA cooperative movement from its inception in the late 1940s to the early 1990s. The 2013 reprint is a new smaller format (5.5 x 8.5) but it includes all the original content, pictures, and historical information. The book is a tribute to the passionate men and women who brought a change to their rural livelihood by bringing electrification to the farmhouse and farmyard. Reprint editions keep the grassroots story alive. 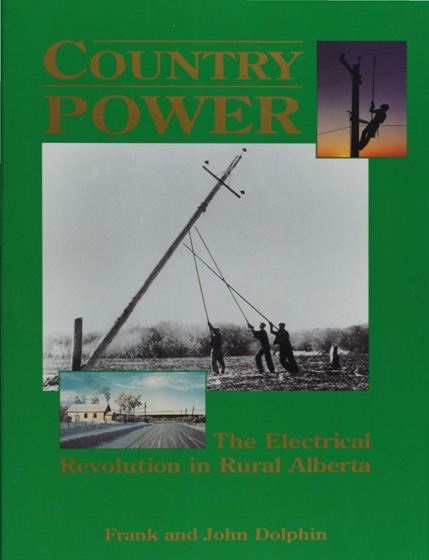 The AFREA-REA history book - Country Power ~ The Electrical Revolution in Rural Alberta, is now available directly from the AFREA. The book was launched at the AFREA AGM and Conference in February and received favorable reviews. Readers loved the smaller size that included all the original text and images displayed in the glossy, hard cover first edition. Books can be ordered from the Sherwood Park Federation Centre office and will be shipped out upon receipt of payment. Member REAs can make arrangements to pick up their order and our office will invoice the REA. Submit your order request using the order form listed below via mail or email. See our Contact Us page for addresses. The original Country Power book was released in 1993 by Plains Publishing of Edmonton AB.